The worst is over, postulates Luisa Moreno. But is modest appreciation in rare earth stocks a symptom of across-the-board improvement in equities, or have fundamentals in the space changed for the better? To tackle these questions, the Euro Pacific Canada analyst gets elbow-deep in metallurgical data. In this interview with The Critical Metals Report, Moreno lends her razor-sharp analysis to determine the frontrunners as metals prices stabilize. TCMR: You recently produced a report titled "Who's the Heaviest?," where you try to clear up some of the misconceptions about Molycorp and its ability to process heavy rare earths (HREEs) at Mountain Pass. Can you share your bullet points to our readers? LM: There is not a significant amount of HREEs at Mountain Pass. It does have HREEs, because rare earths occur altogether, so when you find LREEs, you'll find the HREEs as well, and vice versa. The proportions in which they occur can vary from location to location, however. It is able to separate samarium, europium, gadolinium and all the HREEs from its top-four elements, which are lanthanum, cerium, praseodymium and neodymium. It ends up with a HREE concentrate, which is also known as the SEG stream. This SEG stream usually comes from light deposits because it has a very small percentage of the heavies and it is not economic for them to focus on that small percentage of elements. In my report, I introduced a table (below) that shows the potential production per ton of total rare earths produced for a number of companies. 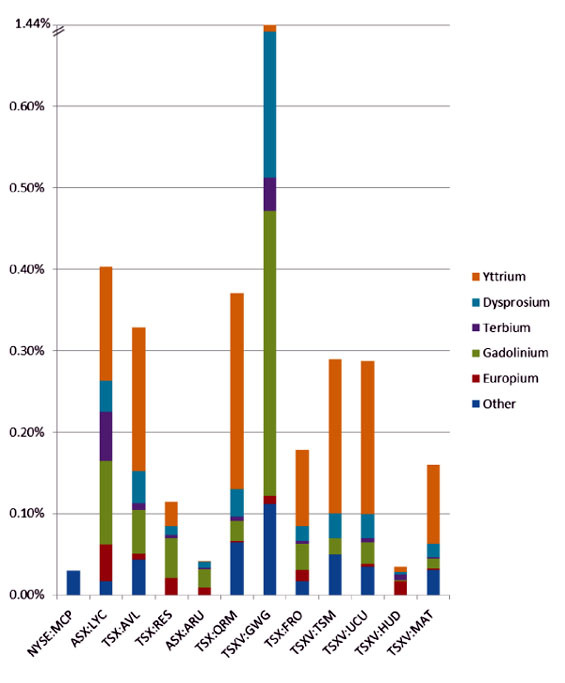 Because the rare earths are all recovered at the same time, is not the grade but ultimately the average proportion of each element that determines how much of each element is produced per ton of output. LM: It's definitely more complex than modeling a simple gold project, as various products have to be taken into account. Analysts usually break down a deposit based on a company's rare earths distribution. We want to know how much of each element the company could extract, and we calculate the total potential production per element. Most of us actually tend to assume that some of the elements that occur in very small percentages are not separated. We give zero value to those, which are usually erbium, thulium, holmium, ytterbium and lutetium. When we do an NPV, we're basically forecasting the production and prices for several elements, assuming that several elements are recovered and each will have its own price and its volume. Determining the NPV is a complex process, and the fact that half the ore or more may have low value, it is indeed taken into account in our calculations. Also important is the recovery rates, production costs and capex, which are also included in our forecasts.